Our detailed repair estimates take into account both your schedule and your budget. Friendly office staff will coordinate with you to ensure a smooth repair with minimal disruptions. We are licensed and bonded and can pull all necessary permits. All work is completed to code, and our technicians handle any required code changes and organize the inspection with the appropriate building department. The day of the repair, our professional plumbers secure the area with barricades and caution tape, preparing a safe, clean environment. 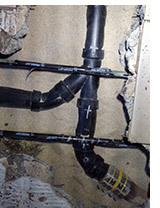 Using the same principles as those listed above, our plumbing crew can also replace the entire sewer line. After excavating the length of the pipe, we remove the old piping and install a new line. Material options include ABS, DWV/PVC, cast iron, and CIOD (fused, jointed PVC pipe). Sand or gravel bedding protects the new sewer pipe from wear and tear. When the terrain allows, trenchless sewer replacement is an excellent, minimally invasive repair option. Our skilled crew excavates two access holes on either end of sewer pipes up to 100 feet long. The trenchless apparatus works by expanding and bursting the old sewer pipe, while feeding a new poly-welded sewer pipe into place. With excavation kept to a minimum, you avoid the hassle and expense of replacing landscaping and hardscaping.